Whether we travel for work or for play, commuting can consume a big part of our day. It can also consume a big part of our mental and physical energy. When we travel the same route every day, we get complacent – which for some of us also means BORED. Some of us find distractions like talking on the phone or eating as great ways to beat the mundane boredom. But, unless we have taken the time to plan our commutes properly, these distractions can become hazardous. Change It Up: The same trip can get old real fast. Choose a different route on alternating days of the week so you can be recharged with new scenery. Just driving at different speeds, with different intersections, curves and stops can keep the brain alert and awake. Be Prepared: Listening to music or audio books are great ways to keep engaged while on the road. But switching radio stations or shuffling through songs on an iPod while driving can be dangerous. In order to keep your eyes on the road, have a playlist ready and loaded and hit play BEFORE you hit the ignition. Brain Food: Long drives can slow the brain and reaction time. Stay focused by feeding your brain with power foods that are easy to eat in the car. Pack some trail mix, power bars or energy drinks for commutes and keep them in containers that can be easily stored in center consoles or cup holders. Adjust Everything: Check your mirrors, your seat position and the location of items you will be using on your commute before you hit the road. If you need lumbar or neck support, have it ready or engaged when you get in the car. Have your phone, purse, snacks, music and anything else you need easily accessible so you don’t have to go searching while driving. 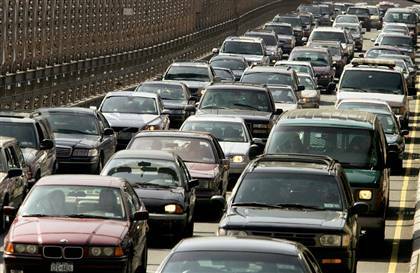 Avoid Traffic Jams: Pay attention to rush hour traffic hot spots and take alternate routes when you can. Steady driving is a lot less stressful than sitting in stop and go traffic. Watch for traffic alerts and check your local traffic advisory before you hit the road. Commute with Friends: You might not like everyone you carpool with, but having other people to talk to and extra pairs of eyes can make commutes safer and smoother. Pick your carpool buddies wisely and make them take turns filling the tank or driving. Plan Ahead: Make sure you have a full tank of gas, toll money or toll card and plenty of time to get to your destination. The most dangerous part of commuting is rushing. And as always, check your fluids, lights, tires and wipers to make sure you are road ready and prepared for any emergencies. What are your favorite commuter tips? Share them with us and empower other drivers! This entry was posted in Auto Safety and Prevention, Safe Driving Tips and tagged commute by Women Auto Know. Bookmark the permalink.